Following the editorial style for Chinese names in the Chicago Manual of Style, the Chinese family name in this page is given first, followed by the Chinese given name. 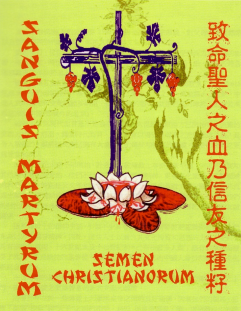 Then comes the Latin baptismal name of the martyr, followed by its Pinyin Romanization (enclosed in brackets). What follows next is the full name of the martyr in Mandarin Chinese. The italicized prefix shi is traditionally attached to the second family name of a widow or married woman. The family name to which it is affixed is the woman’s maiden name.